It's Thrifty Thursday with My Creative Time, a day to use your scraps or recycled products on a project! 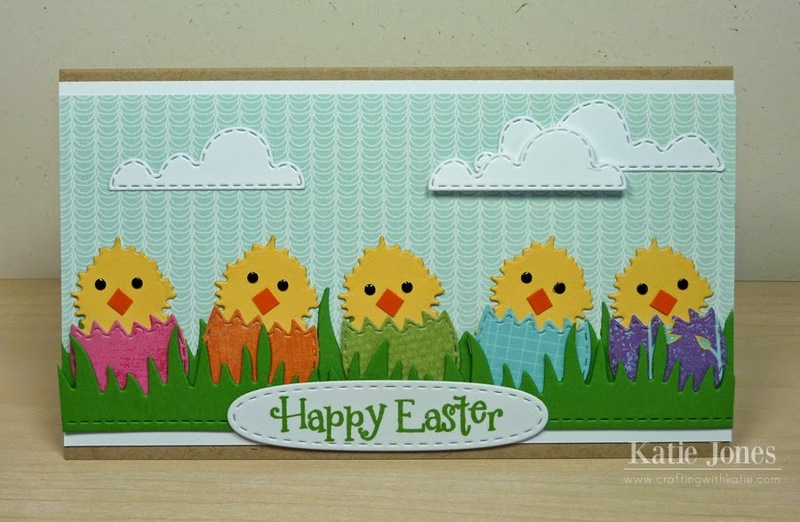 I pulled out my scrap drawers to make a fun Easter card! This a 3 1/2" x 6" card. It took a while to find a good scrap for my sky, but there was one deep in my drawer that worked. I added a few clouds made with the MCT Stitched Cartoon Cloud Dies. I selected a rainbow of scraps for my chicks' shells and cut them with the dies from Hello Chickie! The die for the chick itself comes with a die for the eyes and beak, but there was a small tragedy in my craft room when I was cutting the dies apart. The eyes and beak flew across the room and have yet to be located. :-( I had to improvise with some Glam Rock eyes and square cardstock beaks. The grass that the eggs are nestled in was made with the Stitched Grass Die. I stamped the sentiment, from Hello Chickie!, on an oval made with the Stitched Oval Die. I thought this sentiment, from Happy Hunting, was just perfect with the rainbow of chicks! 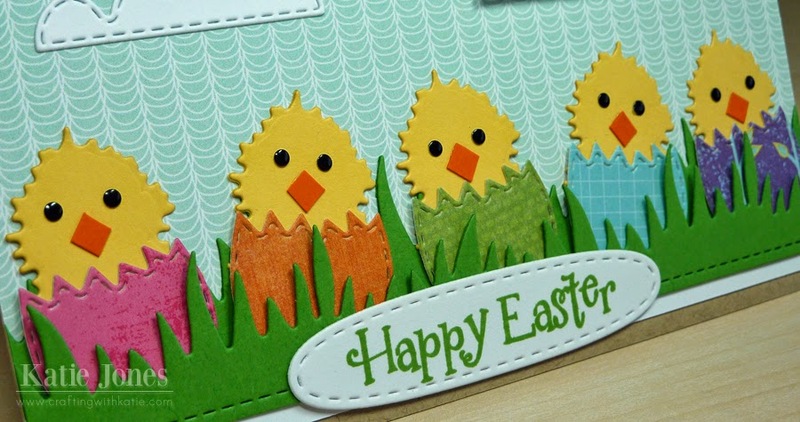 I stamped it on the inside of the card and added a little egg made with another die from Hello Chickie! Oh Katie you card is so cute I love the scene you created all of your ideas are darling. Love the papers you used you sure came up with so many great ideas. Love how you used all of Miss Emma's goodies. Great creative job inside and out!! Adorable!!!! Love all the different coloured shells!!! 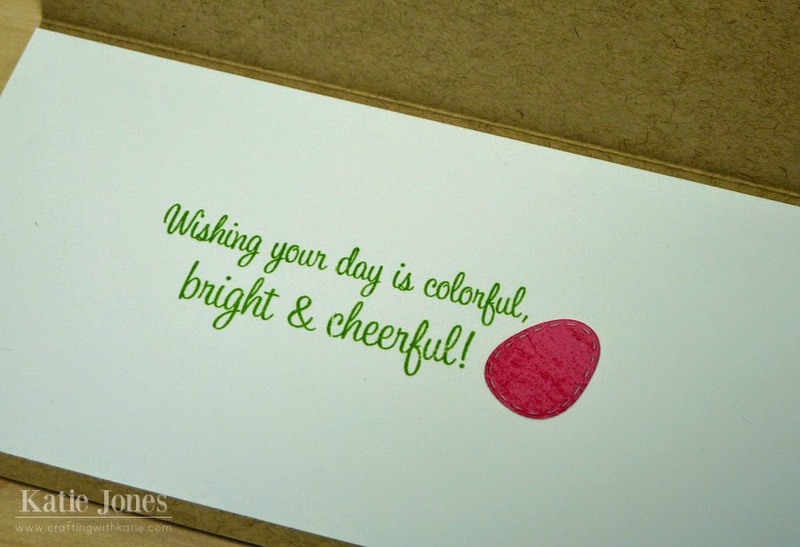 Such an adorable card, and I love the bright colors! This is adorable Katie! LOVE all those CUTE chicks!!!! Your card is soooo adorable! Those chickies are way too cute!! I love the rainbow eggs with chicks...such a cute idea. Sorry about the loss of your eyes and beak...I hope you are able to find them soon...how far could they go? Super job on your card! This card is too cute! I love the rainbow eggs and I could not stop smiling! Katie ~ OMG this is so ADORABLE!! I LVOE that you used the little stone for the eyes ~ I have a ton of those ~ CLEVER!! Then the fun colors too! ADORBS! Yes I am this far behind ~ get ready for stalking!! !